A few "obsolete notes" from Troy from the first half of the 19th century. / photo courtesy of Ferris Coin Co.
Paper money in the United States is pretty boring in its design. (Other countries really have more fun with currency.) But its history includes plenty of weirdness. Continental Currency notes from New York are printed on thick stock paper, with ornamentation around the border, and early versions of the New York Seal with beavers, windmills, kegs and Dutch trading symbols. Some notes have pieces of mica embedded in them or impressions of leaves, which are unique, like fingerprints. "After the Revolutionary War, some towns printed notes, but Americans didn't have much trust in paper money," Demis said. "Americans wanted hard assets, mostly coins." 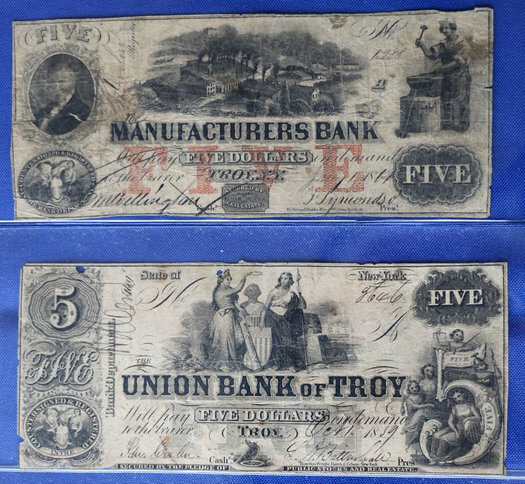 During the 1820s through 1850s, small banks, like Manufacturers Bank of Troy, issued what are now called "obsolete notes" that would circulate in specific geographic areas like the cities of Troy and Schenectady or Albany County. The shop's Facebook page has a bunch of images of the old currency, along with some of the history. The small exhibit will be on display November 1-22, Monday-Friday 9 am-5 pm and Saturday 9 am-3 pm.